Baton Rouge media turned their spotlights on Rheta Grimsley Johnson recently as residents embarked on the One Book One Community summer read program featuring Johnson’s travel memoir Poor Man’s Provence: Finding Myself in Cajun Louisiana. In a show airing July 31, Johnson told syndicated talk show host Jim Engster that she was “flabberagasted and honored” to have her book selected for the One Book program. She spoke about the luxury of being able to live in a community, Henderson, LA, for years before writing about it. Engster noted that Johnson’s “love of the area is conveyed quite eloquently” in her memoir. Johnson also discussed with local WRKF radio Morning Edition host Saiward Pharr the fact that Poor Man’s Provence is selling well outside of Louisiana, and that the One Book program “filled a gap” by reaching her intended audience for this “love letter” to the people of Henderson. 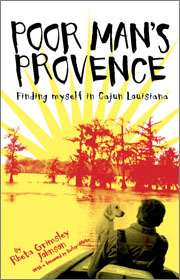 Poor Man’s Provence is available from NewSouth Books, Amazon.com, or your favorite local or online book retailer. OBOC is a citywide book club based in Baton Rouge that aims to use a common reading experience to foster dialogue about intellectual and cultural issues. OBOC organizing sponsors include Baton Rouge Community College, East Baton Rouge Parish Library, Forum 35, LSU, Redstick Internet Services, Barnes & Noble, and The Greater Baton Rouge Literacy Coalition. According to the OBOC press release, greater Baton Rouge area residents are encouraged to read Poor Man’s Provence and to join Rheta Grimsley Johnson for a free public presentation she’ll give on August 20 or to participate in other discussion events. The free event featuring the author happens at 7 pm on Thursday, August 20 at LSU’s Cox Communications Academic Center for Student Athletes; the Cox Center is located on the corner of Fieldhouse and N. Stadium Drives on the LSU Campus. Reading guides and additional information about Poor Man’s Provence and the OBOC program can be found online at www.ReadOneBook.org. The Mississippi Institute of Arts and Letters recently named NewSouth authors John Pritchard and Rheta Grimsley Johnson to a short list of nominees for their annual awards ceremonies. Previous winners included such celebrated novelists as Richard Ford and Shelby Foote. Mississippi’s Rheta Grimsley Johnson is nominated in the non-fiction category for Poor Man’s Provence: Finding Myself in Cajun Louisiana, which is equal parts memoir and travelogue of her time spent in Southwest Louisiana’s Cajun Country. She has covered the South for over three decades as a newspaper reporter and columnist, writing about ordinary but fascinating people, mining for universal meaning in individual stories. Syndicated today by King Features of New York, Johnson’s column appears in fifty newspapers nationwide. Since 1978, The Mississippi Institute of Arts and Letters annually recognizes the greatest accomplishments in art, music, literature, and photography among current Mississippi residents, or former ones with continued, significant ties to the state. Winners in each category receive a cash award of $1,000. Judges for the awards are chosen from out of state and are prominent in their respective fields. This year’s MIAL awards gala marks the 30th anniversary of the foundation and will be held on June 13, in Laurel, Mississippi at the Lauren Rogers Museum of Art, accompanied by an art exhibition of previous winners from the pasty thirty years. The Yazoo Blues and Poor Man’s Provence are available directly from NewSouth Books or your favorite local or online book retailer. Several years ago, Williams and NewSouth publisher Suzanne La Rosa approached Johnson about writing a book. “Luckily for us, she had these Louisiana stories rattling around in her subconscious, so our expression of interest was an opportunity for her to put them on paper and expand and shape them into a book,” he said. “If you can get to the end of that chapter with a dry eye, I don’t want to meet you,” he said. These neighborhood children, Johnelle and Jeanette Latiolais and others have become very important to Johnson and her husband through the years. Henderson has charmed its way into their lives. One of their favorite spots is the bait shop, of all places, where you’ll find a bunch of old men sitting around talking about the fish that got away. The neatest thing about it, though, is that these old men speak in French. Such scenes are just too much for a self-described Francophile to resist. That’s just one of the things Johnson has learned since discovering the place. NewSouth Books celebrates the upcoming release of noted columnist Rheta Grimsley Johnson’s book Poor Man’s Provence with special excerpts from the book. Poor Man’s Provence will be available from NewSouth Books, Amazon.com, or your favorite local or online book retailer in February 2008. Johnson is currently working on a book about the Cajun culture in Louisiana, [Poor Man’s Provence]. “It’s the most different place you can go without a passport,” she said. Johnson said she found a number of similarities between the French-influenced culture there and the rest of the South, including a common obsession with art and food. “Where else do you spend hours on preparing a meal besides Paris and Montgomery?” she said. See the full article at the Montgomery Advertiser website. Poor Man’s Provence will be available in Spring 2007 from NewSouth Books. For more information, call NewSouth directly at (866) 639-7688. You are currently browsing the archives for the Poor Man’s Provence category.